Yesterday I happened to be in the Richmond district, in the North West corner of the city. I haven't been there very often, and the only things I could remember were the fog, which hits earlier and it's thicker than in the rest of the city, and the large Russian community, which explains the huge concentration of piroshki, blini and caviar for sale in all Geary Street's produce stores. Among the products that grabbed my attention, the myriad of little pies, all with SUPER EXTRA perfect edges, some Baileys scones that would give me a buzz at the first bite, and, of course, the legendary Soda Bread, the traditional buttermilk Irish bread (and then, since we're still in San Francisco, I couldn't help noticing the focaccia bread, which I think is not properly Irish, but I could be wrong...). I've immediately remembered this recipe that I had tried years ago from J. Hamelman's book on bread, Bread: A Baker's Book of Techniques and Recipes, which is sort of a Bible for all those who like kneading some dough. And I've also remembered that in order to make it right, one would need a special whole-wheat flour, genuine Irish, which is impossible to find here. I had the nerve to ask the saleswoman if they could sell me a little of that flour, like if I didn't have already a wide collection, with my all-purpose, type 0, pastry flour, bread flour, whole-wheat, whole-wheat pastry flour, corn, extra-fine corn, semolina, garbanzo beans and chestnut flour (and I'm sure I'm missing something here...). No, I'm sorry, it's not for sale. Perfect, I love this bakery even more and I can even forgive them the olive focaccia. I bow to their expertise, buy a couple of shortbread cookies, simple and fragrant, and I walk away with a new challenge in my pocket. Hamelman, who's lived and worked in Ireland for few years, warn us that it's practically impossible to reproduce Irish Soda Bread on the other side of the ocean, both because there is no proper flour, and because the buttermilk we have available is only a poor imitation of the Irish one, tangy, full of flavor and fat from those green-pastured cows. Ehi, it wasn't me who said so! And yet, it's Hamelman himself who gives us a couple of tricks that can yield a quite satisfactory result: the first is to use a mix of whole-wheat flour and coarsely ground wheat flakes (that can somehow substitute the Irish whole-meal flour); the second is to substitute approximately 20% of our buttermilk with an equal amount of yogurt or sour cream. 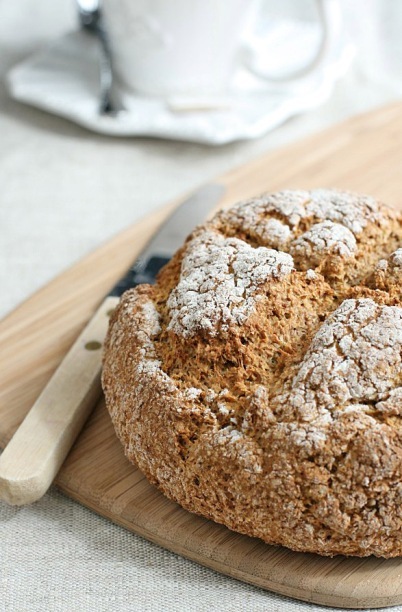 A patch here and a patch there, and we have our own version of Irish Soda Bread. After all, if John Campbell from Belfast is selling me focaccia by weight, I think I'm allowed to make his bread, don't you think? And it's still Hamelman, God bless him, who comes to rescue me with a footnote below the recipe. When I read his words, I almost wanted to catch a plane and go visit him in Vermont to thank him in person. I know I'm going into a difficult subject and the arguments can't be reduced to few lines, but, even if I like to experiment in the kitchen, I'm fundamentally against the modern philosophy of having everything of everything everywhere. It's what I call ubiquitous strawberry. Not only strawberries, but also grapes, pineapple, blueberries and peaches available all year round: it sounds like the description of the Garden of Eden, instead it's today's reality, to me not exactly heavenly. I'm against the ubiquitous and universal strawberry, just like I'm against burrata cheese in Chicago or Sicilian granita in Bormio (small village in Northern Italy). Yes, you can make it, but please don't call it Sicilian granita , the same way they call Parmigiano that plasticized cheese from Chile, or Mozzarella that sort of processed cheese that never goes bad. Ehm...forgive me...I'm digressing here. To go back to our subject, I'd like to finish off with these words, about our Irish Soda Bread: "In a way, I'm glad we can't quite duplicate the bread here; like the Guiness, it's somehow right that soda bread can't simply cross the ocean and still be as good as it is in Ireland herself". for one round loaf of approximately 500 gr. First of all, grind wheat flakes in a food processor, without turning them into powder, but keeping a coarse texture (I didn't have to do it, since the ones I bought were already good to go). In a large bowl mix all dry ingredients together. If you're using yogurt (or sour cream), add it to the buttermilk and stir well until the mixture is smooth and homogeneous. Pour buttermilk over flour mixture and mix lightly for few seconds. It's good enough when the dough comes together and forms a ball. It's not necessary to work it too hard (remember the old muffin rule?). You can make it by hand and without a mixer, because it's nothing like a traditional bread, being more like a compromise between bread and muffins' or scones' dough. Turn the dough onto the work surface, dusted with flour, work it to give it a round shape and gently flatten it to eliminate any air pocket inside. Dust its surface with flour, transfer the bread to a baking sheet lined with parchment paper, and divide it with two perpendicular cut, pushing the blade about 80% of the way down. Bake it at 475 for 15 minutes, then lower the temperature to 450 and bake for another 15 to 20 minutes. You will get a nice golden crust. If the bread is still pale along the cuts, it means that it's not fully cooked. If that's the case, keep baking it for few more minutes. Let it cool on a rack before slicing. 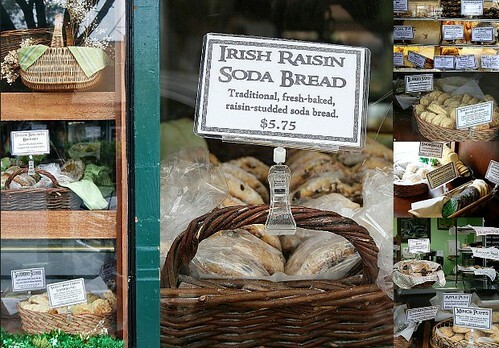 Irish Soda Bread should be eaten the same day. You can freeze it, or keep in a paper bag for few days, then slice it and lightly toast it before eating. The inspiration for the project came to her after seeing a documentary that included an interview with a young Syrian refugee who said he couldn't get out of his head the images of the violence he had seen. She says she wondered: "What goes on in the heads of the. People in my country?". The rocky coast looks natural and, in part, it Oakley Sunglasses Sale UK is. However, there has been much coastal quarrying in the past. The cranes have mostly gone. Surprise Fame Monsters: You just never know who is going to show up to the MTV Movie TV Ray Ban Sunglasses Sale UK Awards. In the final Sac Longchamp Solde minutes of last night's telecast, Best Music Documentary Bolsos Michael Kors Baratos winner Lady Michael Kors Purses Clearance Gaga arrived to present the award for Best Movie. After wishing the audience Happy Pride Month, the A Star Is Born star was able to give Longchamp Soldes Destockage the cast of Black Panther the biggest award of the night.